Completed in spring 2013, the James W. and Frances G. McGlothlin Medical Education Center is a state-of-the-art facility for medical school teaching and learning, which uses collaborative space like no building before at VCU. The striking structure, designed by the firm of the legendary I.M. Pei, includes adjustable classroom space, a technologically advanced learning theater, unrivaled simulation labs and more. 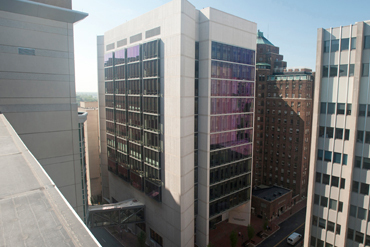 The 12-story, 200,000-square-foot facility also houses research space for VCU Massey Cancer Center. With the opening of the McGlothlin Medical Education Center, the VCU School of Medicine began a new chapter and unveiled its most significant curriculum overhaul in more than 30 years. A committee of more than 200 faculty and students participated in a multiyear planning phase for the new curriculum, which supports vastly innovative methods through team-based learning, individual problem-based learning and simulation. The revamped, dynamic curriculum also features integrated learning modules, earlier exposure to clinical experiences and multidisciplinary training using flexible learning environments, case-based lectures and small-group study. – Jerome F. Strauss III, M.D., Ph.D.
From orientation throughout the first semester, students work in groups on assignments such as performing a successful handoff to obtaining a patient history and physical examination to ordering tests and coming up with a successful treatment plan. Divided into four phases, the M.D. program begins with The Scientific Foundations of Medicine, emphasizing foundational knowledge required to be able to understand the structure, function and pathophysiology of the different organ systems. The second phase, The Applied Medical Sciences, is a multidisciplinary integrated curriculum in which students learn the normal structure and function of each organ system integrated with the pathophysiology of disease and treatment strategies. The third phase, Clinical Concentrations, sees students rotate through the various clerkships of family medicine, internal medicine, neurology, obstetrics and gynecology, pediatrics, psychiatry and surgery. The final phase, Advanced Clinical Concentrations, includes several required experiences and electives at VCU Medical Center and its affiliated sites and at approved medical schools elsewhere in the nation and abroad. 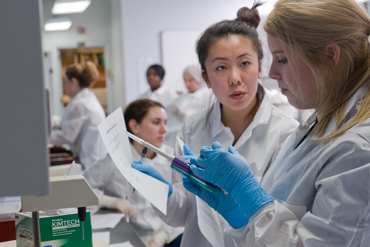 VCU medical students now experience the merger of the clinical aspects of the curriculum with the basic sciences on day one of their education as future health care providers. Ellen Brock, M.D., associate professor of obstetrics and gynecology in the VCU School of Medicine, became director of the Center for Human Simulation and Patient Safety in 2008. Fast-forward five years. 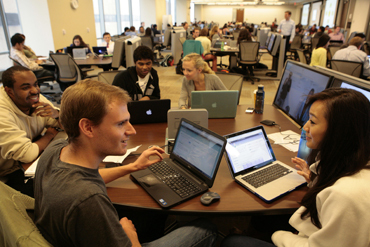 In spring 2013, the center moved to its new home in the McGlothlin Medical Education Center, with seven staff members and 25,000 square feet of state-of-the-art simulation spaces over two floors. “The center, at its core, was designed to bring all of the individual programs and departments and their simulation projects together for the betterment of the entire institution,” said Mary Alice O’Donnell, Ph.D., associate dean and director of graduate medical education. An example of the collaborative partnerships the center has formed to support improved training and patient care includes its work with the graduate medical education “Walk the Walk” simulation experience for 140 first-year residents each year. This orientation is designed to assess and reinforce key skills that all residents are expected to perform, regardless of specialty, as they begin their internship. Jonathan Sorah began his journey as a first-year medical student in the VCU School of Medicine with a weeklong boot camp that focused on how to conduct basic physical exams. The camp included working with standardized patients — trained actors from the VCU School of the Arts — who serve as practice patients. 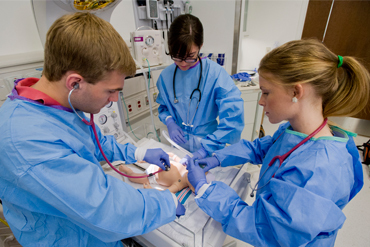 The hands-on start to his medical education was initially intimidating, Sorah said, but served as a great foundation for the breadth of early clinical practice in the school’s new curriculum, which launched in conjunction with the opening of the McGlothlin Medical Education Center in 2013. “The new curriculum is revolutionary in a lot of ways,” said Sorah, who is in the first class to use the new curriculum and the new building. “It seems the goal is to get us out of the classroom and into clinics earlier. Instead of two years of classes, then two years of clinicals, classes are 18 months so that we can spend two and a half years in clinicals. Sorah said it is helpful that the M.D. program’s multidisciplinary curriculum uses an integrated approach and team-based learning, because it more closely emulates the environment he’ll work in as a future physician. Go behind the scenes of the medical education center. See our simulation center in action.